Krispy Kreme* have released more new flavours within their range. Last year I was lucky enough to be supplied their gorgeous Glamour Glaze range & partly being a lifestyle sort of blog at times, food comes into play here & there. The three interesting tastes are Salted Caramel, Pistachio & White Chocolate Nougat & Chocolate Praline Fudge Cake. I was sent a mixture of Salted Caramel & Butterscotch Sundae ( which I believe was already released & not new ? ) but it was just in time for London Fashion Week SS13 and these babies arrived looking to kill my diet ( diet? what diet!? ) Found it interesting a new collection of A/W doughnuts alongside a new collection of S/S clothes. Kind of tied in on my week. I'm not a huge fan of caramel and the chocolate on top was too rich for me and I didn't particularly enjoy the Salted Caramel - my taste buds didn't rejoice. The center of it had oozing caramel that would of complimented the taste buds with the soft dough and rich chocolate. White Chocolate Nougat was softer in taste an original glazed doughnut that was filled in the middle with a soft & thick butterscotch cream (kreme) sprinkled with chocolate honeycomb this was enough to send one into a diabetic coma with all the sweet taste and with a chocolate fan to finish off all the decoration and added extras. Out of the two this sweet, soft baby was my favourite. I love Krispy Kreme doughnuts but can no longer eat them due to my sugar sensitivity. Stupid body ruining my fun. Oh no, sugar sensitivity. Ahhh that sounds so sucky love. I have a very sweet tooth,I love their doughnuts but not a fan of caramel. 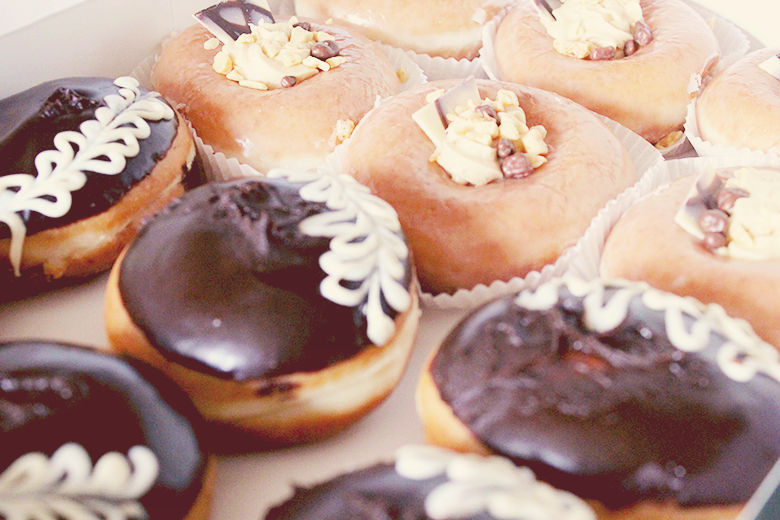 A dozen for me alone-yes please! Ha-ha, isn't it so tempting. I couldn't eat a lot of them felt like miss piggy. She didnt give me any Donuts Annie! And we didnt get any pics with one of them in London on the LFW day....boo!! i feel to be proud after read your article. Baclofen Actually its a need of human and Developing is must for us in successful life.